Topics that support the programming assignment. 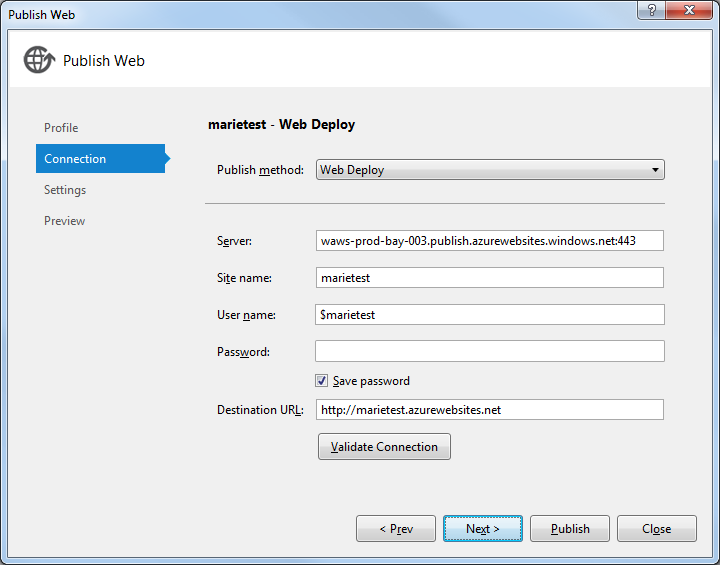 Windows Azure deployment. Your web service will be used by different kinds of apps – mobile, web, desktop, etc. If an app keeps a copy of some of the data from your web service, how can the app determine if it has up-to-date data? One technique is to use a “rowversion” SQL type in the database table. Read the linked document before continuing. How can we use this technique? Well, simply decide what entities should be covered by the technique. Then, in the entity class, create a property named “RowVersion”; its data type is byte. In addition, it should be read-only, so customize the property definition to include only the getter (and remove the setter). In a mobile device app, for example, that app’s code would simply compare its own locally-stored value for that object with the value received in the response. If they don’t match, the app would (on its own timetable) update its locally-stored object if it has received a fully-configured view model, or make another request for up-to-date data. Today’s code example, “ExceptionFilter”, introduces you to a good way to handle and log general exceptions in your app. Windows Azure is a global cloud platform for hosting your web apps and web services. Your programming assignment will be deployed on Windows Azure, so that it will be publicly available. Anyone can get a free 30-day trial. As a student in this course, you can also get a free 150-day “academic pass”. You must have a Microsoft Account to use the Windows Azure platform. Visit the Microsoft Account web site for more information, and/or to sign up for a Microsoft Account. To get started, read the Get started with Windows Azure for students document. You will receive a “promotion code”, which will enable you to request an academic pass. After you submit your request, you will receive an acknowledgement message. Then, later (could be a few minutes, hours, or a day or so), you will receive your login information. The College computers are already configured with the software you need to deploy an app to Windows Azure. Note: The email that comes from the Microsoft has an old link to the SDK. Do not use that link. Manage your Windows Azure resources by using the management portal. Your academic pass enables you to create ten (10) web sites, and two (2) databases. These instructions may be edited to improve their quality. The portal will create your resources in the next few minutes, and will notify you when your web site is ready. Your web site will include one simple HTML document, named “hostingstart.html”. It will open in a browser. 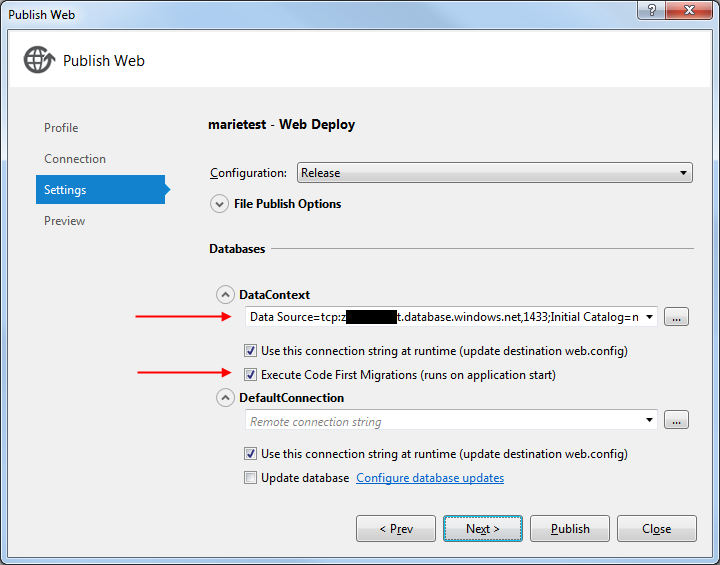 Windows Azure web sites that use a database MUST be configured with Code First Migrations. As an overview, there are two configuration tasks that must be done to your app: 1) configure Code First Migrations, and 2) move your store initializer code. Assuming that your project does not yet include the Code First Migrations configuration, open the Package Manager Console (it can be found on the TOOLS menu in Visual Studio 2012). Run the command “enable-migrations”. It will create a Configuration.cs source code file, and will also create a source code file that ends with “…InitialCreate.cs”. If that’s what you see, then you’re done this task. In your WebApiApplication class file (Global.asax.cs), disable/comment out the statement that runs the store initializer code. Next, in your store initializer class, you have code that creates new objects. You must move that to the “Seed” method in the Configuration.cs source code file. Wrap that code in an “if” test. You know that a new database will be empty. Therefore, check whether whether an entity collection is empty (e.g. context.Programs.Count() == 0), and if so, run the data creation code. 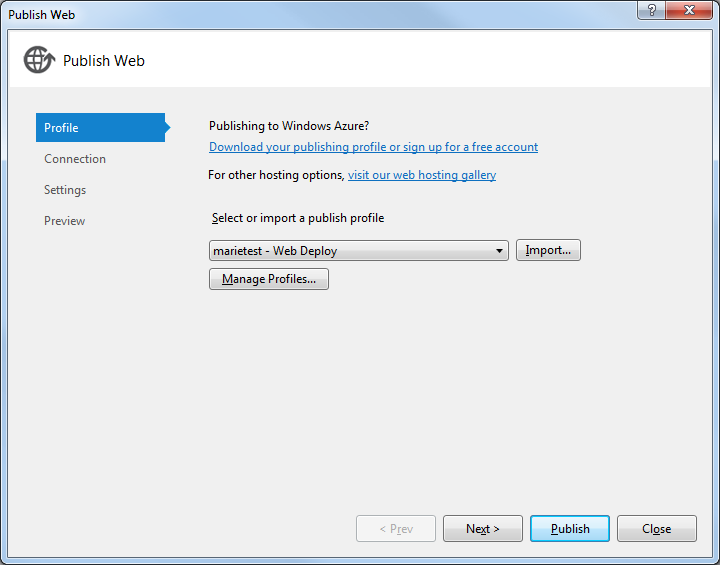 In the Windows Azure management portal, select your web site, which opens a property sheet. You will need a “publish profile”. 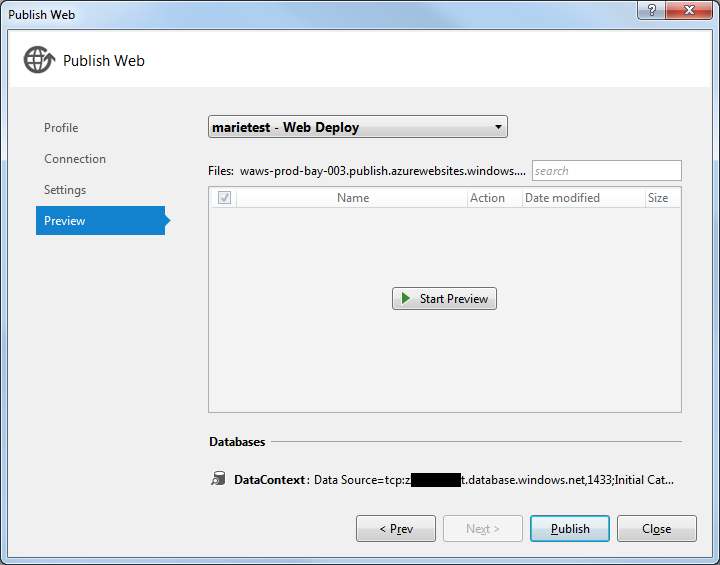 This is a digital document that enables you to use Visual Studio to publish – deploy – an app (and its database/persistence configuration) to a Windows Azure web site. In Visual Studio’s Solution Explorer, right-click your project item, and choose “Publish…”. This is a four-panel dialog that needs to be configured. The left side has links to the four panels. Start with the “Profile” panel. Import a publish profile, by selecting the item that you just downloaded above. This panel is filled in with the settings in the publish profile. Click the “Validate Connection” button, and ensure that you can continue. Use this panel to preview then publish your project. Click the “Start Preview” button, and after a few seconds, all your project files are shown. On future publishing updates, the list will be smaller. Click the “Publish” button. The first time you publish your web site, it takes awhile, because there’s about 50MB or so of content to upload. On future publishing updates, the process is faster. After your app has been published, it opens in a web browser. It’s now ready for the public to use. You can get to it with Fiddler or any other web API client. After you make more changes to your app, you can publish an updated version of your app. In Visual Studio’s Solution Explorer, right-click your project item, and choose “Publish…”. The “Publish Web” dialog appears, showing the “Preview” panel. Click the “Start Preview” button, and after a few seconds, a list of updated project files are shown.